The internet has fundamentally changed B2B buying behavior. Data tells the story- 70% of the industrial manufacturing buying journey happens pre-sales. 93% of buyers conduct their research online. 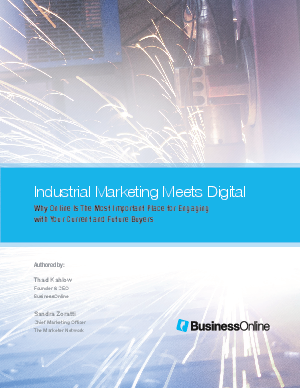 By leveraging the explosion of customer data and aligning marketing with new company buying behavior, proactive industrial manufacturers are realizing the significant growth in marketing ROI that comes from connecting with customers throughout the buying journey. Are you maximizing the value of customer data to market to your prospects throughout their buying journey? Take the first step towards winning in the new marketplace today.